The ability to analyse the acid content of individual berries is enabling Delytics Ltd to help boost the repurchase rates of raspberries, table grapes and cherries. Delytics Ltd specialises in increasing the consumer acceptance and repeat purchase frequency of fruit by improving the eating quality to meet the desired taste experience of consumers in specific target markets. The analysis carried out by Delytics on both the brix and acid in individual berries is helping them understand the full range of flavours and maturity variability within blocks, bunches, punnets and raspberry canes. This information allows them to predict consumer response before harvest and recommend science-based maturity standards to ensure a consistently good eating experience. Delytics is currently analysing individual berry data for projects they are working on for Australian table grapes and the UK-based James Hutton Institute, which is looking to develop resilient flavour characteristics in raspberries. James Hutton Institute project leader, Dr Julie Graham, says Delytics’ recognised expertise in fruit taste prediction, consumer liking and data analytics will help the research team understand how to select raspberry seedlings from the breeding plots that will meet the taste expectations of UK consumers. She is also confident that the acid and brix data Delytics is analysing for each berry will help the project team set robust maturity standards. To get the data from individual grapes, a relatively new measurement technology is being used that can measure the acid in fruit from just 0.3 ml of juice. This technology does not require any harsh chemicals and can quickly and easily be carried out on-farm or in a pack house. 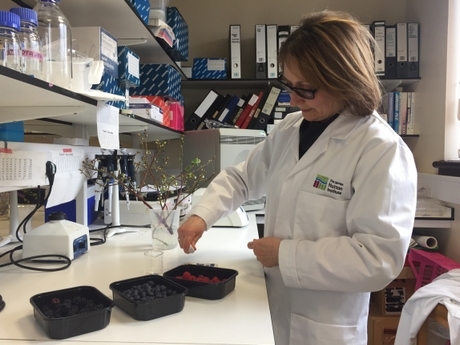 Delytics supports the growers by providing customised sampling protocols to ensure the right numbers of berries are sampled from the best locations. Delytics also has strategic alliances with market leading data collection companies, including Rudge Produce Systems in Australia, who assist with maturity data collection and measurement.